Few trees available to northern gardeners will stop viewers in their tracks as quickly and assuredly as A. x carnea ‘Briotii,’ in bloom, unless perhaps your taste toward spectacular blooming trees is more attuned to the sublime A. hippocastanum (Common horsechestnut). 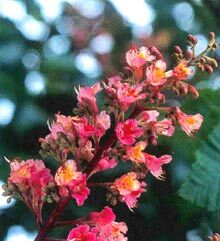 Aesculus is a diverse group of extremely attractive trees and shrubs featuring unusual, often rugose foliage, billowing forms and wide options in size, habit, and bloom color. As is always recommended, note the proper botanical name (Aesculus) in your research and shopping; both common names “Buckeye” and “Horsechestnut” are bandied about in the trade. Horsechestnuts and buckeyes grow well in full sun or partial shade. The soil should be fertile, moist and well drained. These trees dislike excessive drought. Little pruning is required. Remove wayward branches in winter or early spring. 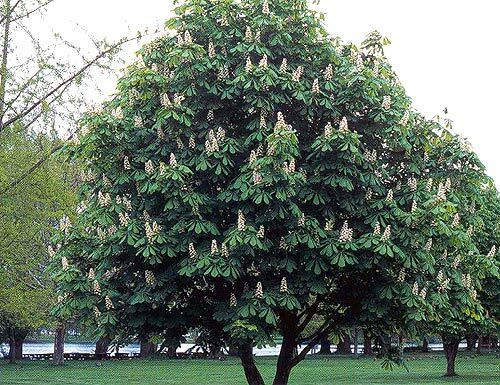 The tree-sized Aesculus species and hybrids are best suited to large gardens as specimen and shade trees. Their roots can break up sidewalks and patios if planted too close. These trees give heavy shade, excellent for cooling buildings but difficult to grow grass beneath. Use a shade-loving groundcover instead of grass under these trees. The smaller, shrubbier buckeyes are useful in a space-restricted setting, where they can be used as specimens, in shrub or mixed borders or in mass plantings to fill unused corners or to cover hard-to-mow banks. All parts of Aesculus plants, especially the seeds, are toxic. People have been poisoned when they confused the nuts of these trees with edible sweet chestnuts (Castanea species).